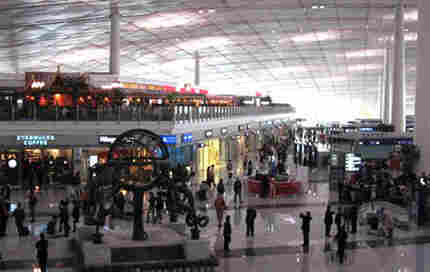 Leaving China : Chengdu Diary ATC HostReturns from Reporting Trip to Chengdu. Rems and Hems with Limited Quite. When I left Chengdu this past Saturday, it was a rainy morning, the sky even grayer and heavier than it had been in the last two weeks, if that's possible. From Chengdu, it's about a 2 1/2 hour flight to Beijing and arrival at the sparkling new Terminal 3, which just became fully operational in March. The airport is stunning, with soaring ceilings covered in open latticework that lets in a lot of light. If you're hankering for American food -- or coffee - you'll find plenty: There's a Starbucks, Burger King, Haagen Dazs, KFC, even a Kenny Rogers Roasters. There were two things at the Beijing airport that really caught my eye. The first was the intriguing sign on a display case that read "Rems and Hems with Limited Quite" Hmmmm. What could it mean? Rems? Hems? Closer inspection revealed that rems and hems include oranges, bottles of liquid, opium, and antiquities. In other words, things you're forbidden to carry on board. Limited, quite. My second favorite discovery was the instant customer service survey you're encouraged to complete as you go through passport control. "You are welcome to comment on our work for immigration inspection," an overhead sign urges. As you stand before the person checking your passport, you'll see a little metal device on the counter in front of you, offering four choices: greatly satisfied (a button sporting a great big smiley face), satisfied (a less exuberant smiley face), checking time too long (frowny face), and poor customer service (frowny face). I sped through immigration -- no line! - and made my choice (great big smiley face). 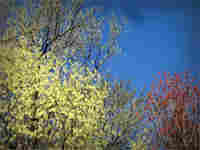 Back at home now in Washington, DC, I'm reveling in bright blue skies and spring sunshine. Which brings me back full circle to where I started on this blog. The one glimpse of pale blue sky I saw in my two weeks in the city of Chengdu (see earlier posts) was a mere early-morning tease, a brief flirtation that raised expectations, only to crush them. I've been thinking about those gray Chengdu skies a lot. What does it mean, I wonder, for millions of people to go for weeks without seeing blue sky, the contour of clouds, stars, or the moon in its phases? I found it profoundly dislocating. It would be easy, I think, to forget you're actually living on a planet. With that helmet of gray overhead, life becomes compressed -- there's no value to looking up, to placing yourself in relation to something higher. I'll be curious to see if the skies have changed at all when I go back to Chengdu in May for the week when we plan to originate much of ALL THINGS CONSIDERED from the city (May 19-23). Our program hasn't ever undertaken an overseas project of this scope. We're all tremendously excited about the opportunity. There are many, many stories to tell in Chengdu that illustrate how China is changing. We're looking forward to bringing you some of them, both here and on the radio.